Though we had a revolution to claim our independence from England, the United States has had a generally positive diplomatic and trade relationship with Great Britain over the last two centuries. But could we have inadvertently exported one of the more horrific American products? That theory surrounds the renewed fame of America’s first known serial murderer, H.H. Holmes. Holmes, who lived in the last half of the 19th century, is featured in a History Channel series called “American Ripper,” which looks into the possibility that Holmes may well be infamous British serial killer Jack the Ripper, who lived at the same time as Holmes. 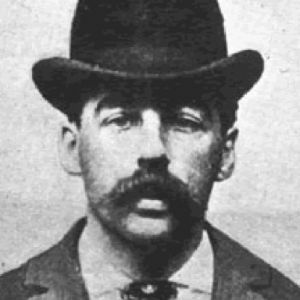 Holmes confessed to as many as 27 murders during the latter part of the 19th century, though actually only less than 10 could be reasonably corroborated. In fact, it was believed that he had claimed to murdering some people who were actually still alive. Nonetheless, he was finally caught after being on the run and was executed for the murders in 1896. Holmes was an interesting case. He was known to be very bright, and had built an elaborate house that later was called the “murder castle,” as it would have a maze of rooms and trap doors that Holmes would supposedly lure his victims into and they would disappear, not to be heard from again. In fact, he assumed the name Dr. H.H. Holmes to be a pharmacist in Chicago, where he eventually worked for a shop owner and ended up taking over the business when the owner mysteriously disappeared. Then the three-story Holmes house was built, which had living quarters upstairs and a maze of rooms where victims would be killed, many of them by gas that was pumped into the rooms. Then, Holmes could move bodies to the basement through a system of trap doors and chutes, and he supposedly could then burn the bodies in the basement kiln. When he was younger, he purportedly performed surgery on animals and was implicated in the death of a childhood friend, though it couldn’t be proven. And there was something to be said for Holmes, as it was rumored that he actually wasn’t executed, and instead escaped and went into hiding. How? He had admitted when he was arrested before his execution that he had defrauded several insurance companies in college by using cadavers to “stand in” for people who were alive, convincing the companies that the people were dead. He was actually arrested for insurance fraud, but while in custody, he confessed to the murders. He wasn’t arrested for the murders initially. Sounds a little like getting Al Capone, who directed the murder of countless people in Chicago, being thrown in jail for tax evasion, not murder. Could he have convinced people that he was dead, while he escaped to England like Speedy Gonzalez and then became “Jack the Ripper,” the most notorious serial murderer of the last 200 years? One documentary series will apparently try to confirm or dispel those rumors. Previous Previous post: Sacco and Vanzetti: Misplaced Justice? Next Next post: How Much Do You Remember About The Manson Family Murders?